October is Adopt a Shelter Dog Month! Even if you don’t have room in your home for another canine companion, you can still celebrate. Just share pictures of your shelter or rescue dogs on social media using #AdoptAShelterDogMonth. It’s also a good time to make your tax deductible donation to your favorite shelter or drop off much needed supplies such as unopened bags of dog food, clean bedding, etc. And here are a few books to “give you paws,” make you smile, and remind you of just how much dogs enrich our lives. 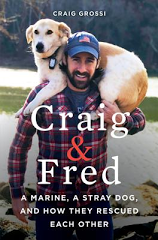 I had the immense pleasure of reading an advance copy of Craig Grossi’s, “Craig & Fred: A Marine, A Stray Dog, and How They Rescued Each Other.” This is the true story of a Marine, stationed in Afghanistan, who bonded with a stray dog over a piece of beef jerky. Despite the fact that dogs were strictly forbidden on the military base, Fred won over Craig’s buddies and they cared for him until they could wrangle transport back to the States for the dog. When the author returned home after his tour, Fred was there to help Craig get back on his feet and adapt to civilian life again. This book isn’t a bit maudlin, rather it celebrates the human spirit with its “pick yourself up by the bootstraps” sensibility. A beautifully told story about the transformative power of love, this one officially hits shelves on October 31st . 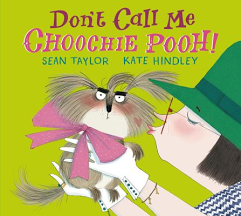 To help your kids celebrate, pick them up a copy of Sean Taylor’s hilarious picture book, “Don’t Call Me Choochie Pooh!” This is a laugh-out-loud tale of a little dog who is fed up with being carried in a purse and treated like a stuffed toy. He longs for the excitement and adventure that he sees other dogs experiencing at the park. His dog park friends get to run, chase after toys, and get dirty. However, he soon discovers that these dogs really aren’t that different from him at all…right down to their silly nicknames. Kate Hindley’s goofy, yet spot-on, dog illustrations will surely put this book into constant rotation for bedtime giggles at your house. 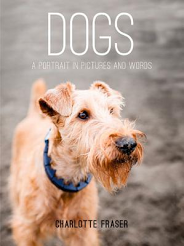 “Dogs: A Portrait in Pictures and Words,” by Charlotte Fraser is the perfect gift book for dog lovers. Filled with beautiful color photos of all kinds of dogs doing dog stuff like digging, getting wet, chasing sticks, and rolling in the mud, along with quotes, brief essays, and tributes to all things canine. There is a hilarious photo of a very smug English Bulldog in the middle of this book along with a quote from Mark Twain, “If animals could speak, the dog would be a blundering outspoken fellow.” Touche. No dog book list is complete without a coffee table book that you will want to thumb through again and again. This time around, it’s “Dogs And Their People,” by BarkPost. 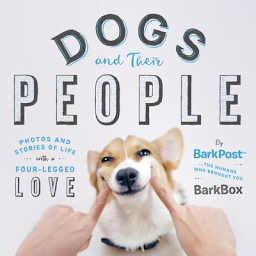 This riotously funny, often poignant, and always insightful full-color book includes the requisite goofy dog pictures, along with beautiful stories of the love, faith, and resilience of our canine companions as told by the people in their lives and shared on social media. You will meet one of Michael Vick’s dogs, Tillie, who wears goofy ensembles to help destigmatize Pit Bulls and promote a better understanding of how dogs can overcome hardship and abuse. And you will also meet Lulu, a trendsetting Frenchie who ended up modeling in a Barneys couture shoes ad campaign, plus 198 other dogs in between.